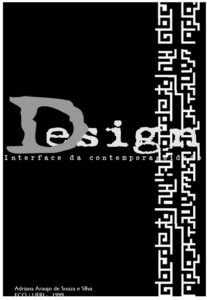 Communication and Image Technology, Department of Communication, Federal University of Rio de Janeiro, Brazil (1999). This thesis analyzes graphic design as an interface of contemporary times, that is, as a (printed / on screen) representation of today’s society. I argue that the shift from functional to contemporary (deconstructed) design is a consequence of the development and use of new digital technologies in the process of organizing information on a page/screen. I define the term “interface” in two different but overlapping ways. First, interfaces are defined as the material information supports on which people produce design, i.e., organize information in space. I develop this idea via a historical analysis of graphic design, including the history of typography, which is the basis of our visual communication processes. Second, I analyze the computational antecedents of the term interface. I emphasize how different interfaces (material information supports) organize information in new ways and, consequently, influence the way we think and how we represent our world. Finally, I focus on deconstructionism as a characteristic of the contemporary graphic interface. Deconstruction is analyzed both in graphic design and on the world wide web. [Defense slides].